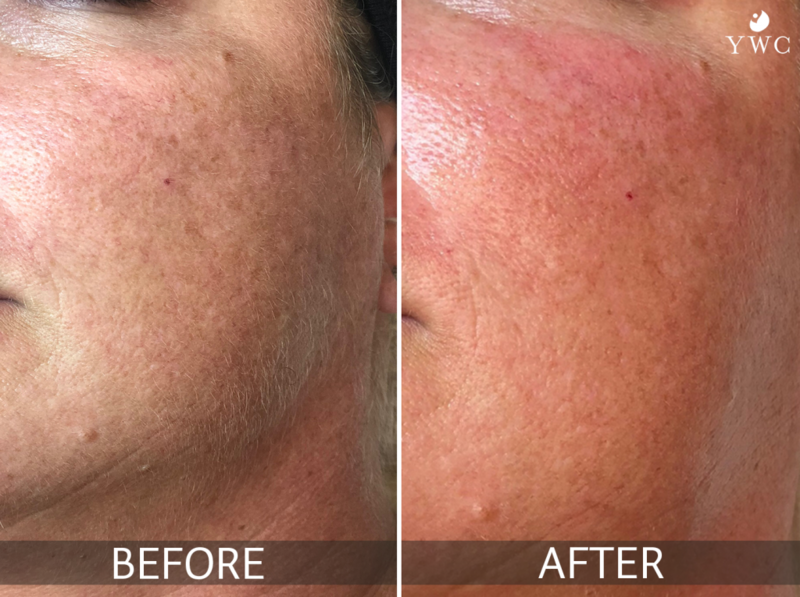 Dermaplaning – not the same as dermabrasion – is a simple, effective treatment for removing peach fuzz (fine hair on your face). Our licensed medical esthetician uses a high-grade, sterile blade to lightly stroke the skin at an angle to gently “shave off” dead skin cells from the epidermis and remove vellus hair for silky-smooth skin. We love pairing this treatment with our HydraFacials. Call us at 513-791-9474 to book an appointment or free consultation. At your appointment, our licensed medical esthetician will review your skin conditions, goals, and at-home products. She’ll recommend additional products as necessary. The most common treatment areas are the face, chin, and neck. Due to the contours of the face, certain areas are not treatable with dermaplaning (such as eyelids and noses). It feels like a light scraping against your skin, as if you were shaving. One treatment takes about 30 minutes. Paired with our HydraFacial, one treatment takes 45 minutes. We recommend dermaplaning every 3-4 weeks, depending on how fast your hair grows. Each treatment removes 2-3 weeks’ worth of dead skin cells and built up oils. Avoid tanning beds and direct sunlight exposure. Avoid aerobic exercise or physical activity until redness has subsided. You will be able to see a noticeable difference immediately following treatment. Contrary to popular belief, dermaplaning will not cause your hair to grow back thicker or darker after treatment. It will continue to grow at the same rate, color, and texture as before. Clients with sensitive skin may experience redness after their first couple of sessions, but this should disappear after 2-3 hours. For more information, please see the “Dermaplane take home instructions” form in the box to the right. Our licensed esthetician will work with you to minimize discomfort and/or side effects. Dermaplaning is a good option for many people, but our licensed esthetician will discuss your health and beauty history with you prior to your first session. You will also be given a thorough skin analysis before your first dermaplaning treatment to ensure your goals can be achieved. This is also a great treatment for women who are pregnant or breastfeeding and want a deeper exfoliation without any chemicals. It should be noted that due to hormonal changes, your skin may be more sensitive, so please tell our esthetician if you are pregnant or breastfeeding.